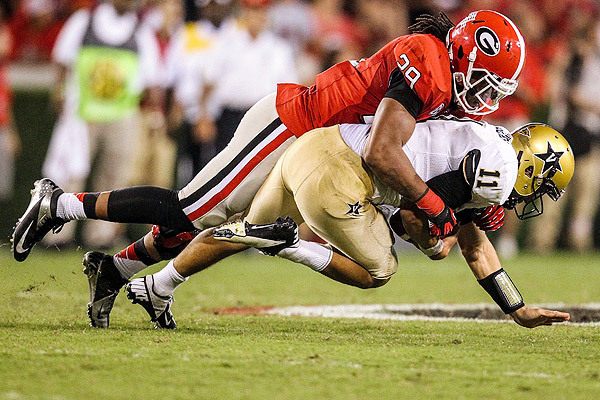 Jarvis Jones has gone from a sure-fire prospect to an enigma. If you go by talent alone, he blows you away, however, since February, his draft stock could be falling. First off there is an issue with his neck. This is a condition that has been known about for a while. In 2009, while playing for USC, he had numbness in his shoulders after a hit and sat out the rest of the game. Initially it was diagnosed as a stinger, but later it was determined to be neck stenosis which is a narrowing of the spinal column. USC did not feel comfortable reinstating him, so he transferred to Georgia after the season. He played two seasons at Georgia with no issues. How will this affect his draft status? Teams will have their doctors examine him and determine if it’s something that would allow him to continue to play. I’m sure some teams will remove him completely from their draft board, not wanting to take a chance on him. Then came the Combine and Jones decision not to work out. Many people did not understand that decision and several teams were not happy that he was not working out. Since there is no contact at the Combine, why skip the workouts? This put a great deal of pressure on Jones to perform well at his Pro Day on on March 22nd. However, when he finally did workout for teams he ran a 4.95 40 yard dash which is very slow for a 245 lb linebacker. As a comparison, five offensive linemen, all over 300 lbs. ran at least that fast. He also did not look very smooth in any of the on-field drills. My gut feeling is that Jones has not trained for the workouts. If that’s the case, then that raises another red flag. Is he an arrogant player with no respect for the process? It’s hard to tell, but the case could be made. There is no doubt that when you put tape on of Jones, he shows up immediately. Playing in the SEC, he faced the top talent in NCAA football, and they had no answer for him. He has 28 sacks in the last two years. In 2012, Jones led the country in sacks (14.5) and tackles for loss (24.5) and forced fumbles (7). Jones is an aggressive, disruptive player that creates havoc for the opposing offense. When you play against Jarvis Jones you have to know where he is at all times. He is a natural pass rusher and is relentless in pursuit of the quarterback. Even when he doesn’t get there, he causes the quarterback to rush his throw which can result in turnovers. Jones plays with good leverage and attacks the line of scrimmage. In the SEC Championship game, Alabama exposed a weakness in Jones’ game. In the 2nd half, the Crimson Tide decided to run the ball right at him and got huge chunks of yardage. However, Jones isn’t the only person that has struggled against the Alabama running game, just ask Manti Te’o. Jones is natural fit for a 3-4 defense at outside linebacker. He could play in a 4-3 also, but I think the 3-4 is tailor made of his abilities. Put him on the outside and tell him to go get the quarterback. I wouldn’t even ask him to drop into coverage. With his skills, I’m gonna turn him loose to do what he does best. If I’m an NFL team and I’m interested in Jones, my game plan is to bring him to my facility and put him through the paces. Jones may be one of those guys that plays better in pads than in shorts. If that’s the case then you have to go by what you see on tape. If I had to pick between what I see in shorts and what I see in pads, I’m going with the game tape every time. So how far does he fall? Will he drop out of the top 10? It’s hard to say, but if he falls as far as the Steelers at pick 17, I think they would jump all over him. He is the kind of player the Steelers are known for. Ultimately, it won’t be about where he’s drafted, but whether or not his neck will be an issue in a very physical league. Any time you talk about an issue with the neck, it’s a scary thing. This entry was posted on March 26, 2013 by draftmaniacs in Draft profiles and tagged 2013 NFL Combine, 2013 NFL Draft, 2013 NFLDraft, Georgia football, Jarvis Jones, NFL Draft.